It's Labor Day weekend! Usually this means the end of the summer- and everyone is trying to squeeze in the last of it! I'm celebrating the end of summer with a cool treat! 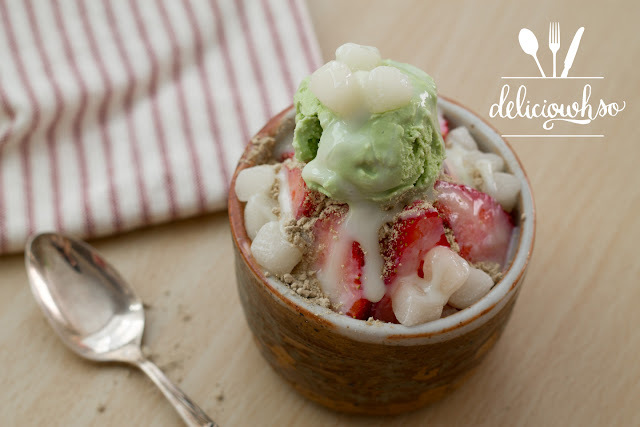 This is a simple Korean dessert that you usually find at every Korean bakery during the summertime. It's a simple classic that never goes out of style! The best part of this dessert is that it doesn't require measuring! You can really just choose whatever you think would taste good, and put it in there! It works best if you have an ice shaver or snowcone machine, but if you're able to crush the ice into small pieces, it should work too! I'm including a recipe that I used, but you're always able to change it to whatever suits you! 1. Shave the ice using a shaver or snowcone machine. If this is not available, be sure you crush the ice to tiny pieces. 2. Place the ice into the freezer while you get the rest ready. 5. 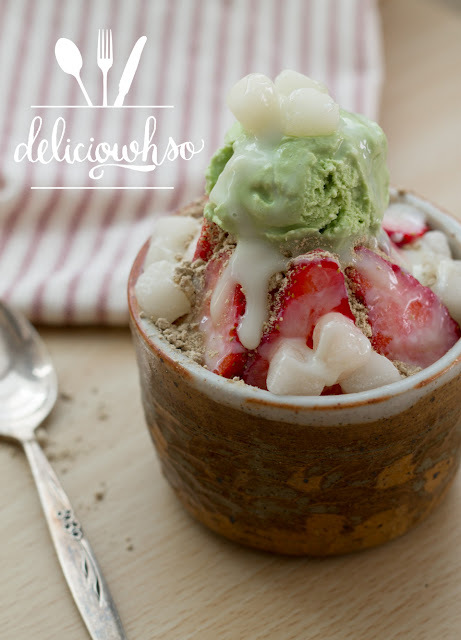 Arrange strawberries, mochi, and ice cream onto the ice. 6. Sprinkle roasted grain powder. 7. Drizzle sweetened condensed milk over the dessert. This dessert is usually made with sweetened red bean paste also. I'm not a huge fan, so I decided to go without it this round. This dessert is totally up to your own interpretation, which allows you to express your own creativity! Post your creations on Facebook or Instagram and tag @deliciowhso!